Eldar are the first, and so far only, army that I've ever really collected, starting way back in the '90s before taking a break from wargaming that lasted roughly 15 years. Currently I have around 2500pts of mostly painted Craftworld Eldar that have barely seen a tabletop battlefield in the intervening time, so what a great time this would be to finish them! 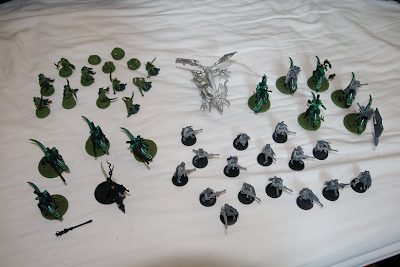 Of course, we already have two great Eldar blogs on this site already, so for my Tale I've decided to do something my younger self dreamed of, but which my older self's disposable income can finally afford: Exodites. Exodites are the Eldar's more prescient cousins, who foresaw that the decadence taking over the Craftworlds would end in their ruin, and fled the apparent safety of their homes before the time of the Fall. This meant that they were mostly far, far away when the psychic shock resulting from the birth of Chaos almost totally destroyed the rest of the Eldar race. Now they live on savage Maiden worlds, eschewing the more advanced technologies of the Craftworld Eldar, and living a mostly nomadic existence following the herds of 'Dragons' that live on these planets. I’d first spotted the Exodites as a teen, with the few drawings in the Eldar codex showing long necked dinosaurs and their sleek Eldar pilots, with massive guns strapped to their back, and the couple of models that came out in the Epic range. Dinosaurs with lasers? How could I pass up the opportunity to create a unique looking army like that? (Well, mostly unique). Unfortunately a complete lack of skill or knowledge, or cash with which to buy parts, contrived to put the idea to the back of my mind, where it stayed until the idea of this blog came about. Now, after I decided I wanted an Exodite army I scouted round the GW range for appropriate bits and mainly chose to take things from the Dark Elf, Wood Elf and Craftworld Eldar ranges, before looking around the internet and finding out that other people had had the same ideas, and pulled it off with immensly more panache and skill than I could ever muster. Unperturbed, I built myself a nice little starter force using this codex as inspiration for each unit, but as none of it is yet quite finished it seemed like an ideal project with which to begin my Tale. To start with I’m going to finish a unit that to me is the epitome of the Exodite army: Dragon Knights. These are mainly Dark Elf Cold Ones fitted with Guardian bodies and Dire Avenger heads, as I think the crest makes them look more knighty than plain old Eldar heads. They’re all armed with shuriken catapults, so they can be used as counts-as jetbikes on the tabletop, and I’ve used bits from the Wood Elf sprues to make the bases a little more interesting. The mounts are already mostly painted, with just the detailing left to do, undercoated with a grass green paint followed by green and turquoise washes for the skin pattination, and details added with the purple of my Exodite clan and the spines picked out in white and pale green. Only some of the riders, however, have any paint on them at all, and some need heads and a little bit of green stuff before they're ready to be undercoated. Before I get down to painting then, I’m going to finish off modeling the remaining Knights so I can get it all done in one block. I’ll be posting regular updates on this here blog, and don’t forget to check out the Tale of VIII Painters page to see what everyone else is up to. Look forward to seeing the dragon all done up! I think this is a great project, though I didn't realise you were working from an unofficial codex. You could probably field this using the official codex too, Dragon would make an amazing fire prism proxy, and the new fire prism rules are shiny! I've managed to knock this into a 1250pts counts-as army using the new eldar codex. The dragon is a wraithlord with glaive and twin flamers. And a shuriken cannon when i get round to making the rider. As for the fire prism, I have a lizardman stegadon ready and waiting just for that purpose... Watch this space! You might consider giving wraith-lord a scatter-laser. Makes the flamers Twin-Linked. Pic, do you have anything fror the fire prism gun? I have an old metal Prism Cannon and emitter sitting in my bits box you can have if you want it. Also I have a pair of those legs you are using on the riders you can have too?